(Collective Evolution) Those of you who read our articles on UFOs and extraterrestrials will know that we like to emphasize how seriously this topic is taken by government agencies around the world. Many people are still unaware of this, but it’s true — in recent years, dozens of governments and defense intelligence agencies have officially released thousands of pages of UFO related documents into the public domain. We also like to point out, just to familiarize our new readers with the topic, that these declassified files indicate not only that UFOs are commonly tracked on military ground radar, but also that they are tracked on air radar and visually confirmed by the pilots who are sent to check them out. This is precisely why hundreds of high ranking political and military personnel, alongside researchers and academicians around the world, have been speaking out about this topic for the past few years. You can read more about that here. This article does not go in-depth into the UFO/extraterrestrial issue. To learn more about it, please visit the exopolitics section of our website to learn more and view our most recent to latest articles on the subject. Along with all the photos, documents, and statements from high ranking people, we also have officially verified UFO footage captured from amateur cameras, as well as footage of strange and inexplicable anomalies taken by NASA cameras. Below is one example out of many, and it comes from the NASA STS-48 Discovery Space Shuttle that went into orbit in 1991. In the video, you will see approximately twelve objects moving in a peculiar fashion. The most fascinating part occurs when one object, at a point near the horizon, is heading toward Earth and, as a flash occurs at the 33 second mark, another object moves rapidly across the field of view, and the object heading toward Earth shoots off into outer space at high speed. The statement above comes from Dr. Jack Kasher, Ph.D, Professor Emeritus of Physics at the University of Nebraska. He is one out of multiple physicists (and scientists) to examine the above footage. The fact that the entire world saw this footage meant that some sort of explanation had to be given, as the film attracted a great deal of attention, and rightfully so. It is difficult to dismiss seeing strange glowing objects floating around and then sharply changing direction. Here is another publication by Carlotto that was published in the journal Scientific Exploration. Carlotto is an image scientist with 30 years of experience in satellite remote sensing and digital image processing. He has held several positions in academia and industry. You can learn more about him and find a few more of his publications here. James Oberg, an American space journalist and historian who worked with/for NASA, published an article claiming that the flash in the STS-48 video was the result of thruster firing, which led to the disruption of ice particles as a result. But an examination published in New Frontiers Science by Lan Fleming refuted the ice particle claim, stating that the telemetry data doesn’t support this theory. The paper published by Carlotto (above) also refutes this claim. 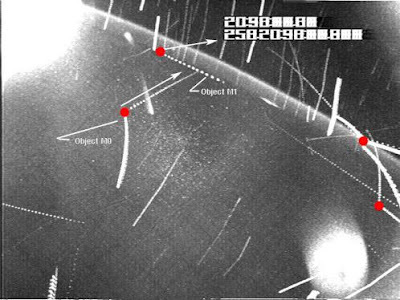 An independent analysis by Dr. Jack Kasher (quoted above) produced five proofs that the objects seen in the video could not be ice particles disturbed by thruster firing. Carlotto found that instead of the objects following a linear path, many of them travel in circular arcs, which implies the objects were far from the space shuttle and moving at a high rate of speed. This is pretty bizarre and shocking footage that really has no solid explanation. If we look at all of the evidence surrounding the UFO phenomenon and the extraterrestrial hypothesis (with its own attendant evidence) as a possible explanation, this really does become difficult to dismiss as a conspiracy theory. So, what are your thoughts on the footage?